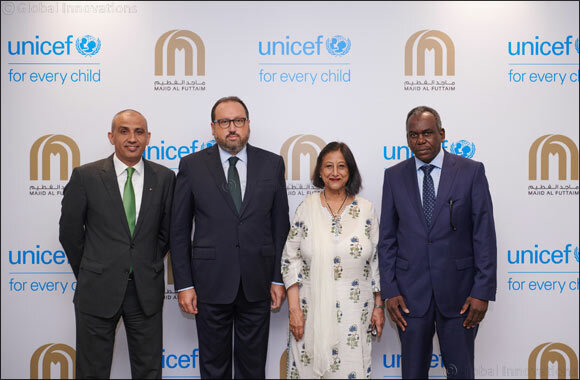 Dubai, United Arab Emirates, 9 September 2018: Majid Al Futtaim, the leading shopping mall, communities, retail and leisure pioneer across the Middle East, Africa and Asia and the United Nations Children’s Fund (UNICEF) have announced their partnership to help send one million children to school by 2020. The two parties have signed a Memorandum of Understanding (MoU) that aims at providing quality education opportunities for the most vulnerable and marginalized children across the MENA region, starting with 200,000 direct beneficiaries which will include children, parents and teachers. Aligned to Majid Al Futtaim’s socio-economic sustainability goal, ‘Transforming Lives’ and the UN Sustainable Development Goal (SDG 4), the partnership will focus on improving access to integrated and inclusive early childhood development programs. This will result in improved child-friendly education, safe learning environments, promoting life skills and citizenship education for children in Egypt, Jordan, Saudi Arabia, Oman, Lebanon and United Arab Emirates. Despite the decreasing number of out-of-school children in the MENA region, which has dropped by over 18% since 2008, bringing hope and new opportunities to millions, the region still has nearly 22 million children who are either out of school or at risk of dropping out. These children include the most vulnerable, including girls who live in rural areas and those from minority communities. Majid Al Futtaim’s assets in six countries – Egypt, Jordan, Saudi Arabia, Oman, Lebanon and United Arab Emirates. Majid Al Futtaim Shopping Malls recently launched an awareness campaign encouraging visitors to share their moments across social media platforms and Majid Al Futtaim will donate AED 1 to send children to school with every post. VOX Cinemas has already raised over AED 300,000 (close to USD $100,000) from 100,000 unique customers across its different locations.